For me who’s struggling to see how five months of 2017 is nearly over, I took a mental break and reached for “The Scent of You”. 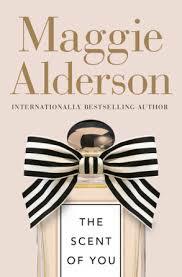 “The Scent of You” is Australian author Maggie Alderson’s 10th novel. It is a story of loyalty and of letting go, of following your heart or your head, and the conflicts within. Hippolyta Masterton-Mackay, Polly to her friends, is a mother to Lucas and Clemmie, both of whom are away at university. She is also a successful blogger, an initial hobby which is now work, and a yoga teacher. Polly is daughter to Daphne, a glamorous model at 85 years of age and living in a posh retirement home. Though she was quite emotionally absent from Polly in her younger days, Daphne now seems to have great insights into the dilemma her daughter is facing. The dilemma – Polly’s husband has vanished after declaring his need for space. What is Polly to do? It is through her perfume blog in which she wrote of how scents evoked memories, and vice versa, which causes her to chance upon Guy, a gifted perfumer making a break in the world of scents. Guy quickly became one of her inner circle, but could there be more? Around the same time, Polly reconnects with an old school friend, Edward, with whom she had shared an innocent kiss on the beach. Chum, a nickname for Edward, visits his stepfather at the same retirement home in which Daphne resides. And before long, Polly and Chum are taking long walks in the country, familiar and comfortable with each other’s company. Is familiarity a better choice than the excitement of Guy? As Polly grapples with her bewildering situation of lost husband and emerging relationship, she is supported by her yoga students, Shirlee in particular. What will Polly do? Will Polly take this opportunity to realise who she wants to be? “The Scent of You” is light and entertaining, a worthy beach holiday read. Or read anywhere really. This book is filled with warm characters, lovable and flawed. Pick it up and enjoy! Previous PostOutshine: An Ovarian Cancer Memoir #bookreview @KIngallsAuthorNext Post#Bookreview PRACTICING NORMAL by Cara Sue Achterberg (@CaraAchterberg) A great book about the games families play and what love really is. It sounds like a relaxing read, and sometimes that’s what one needs. Thanks, Florence!